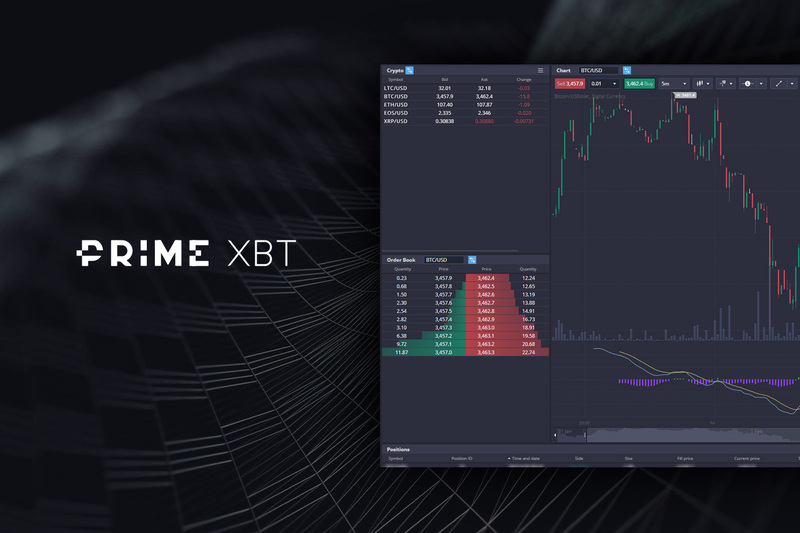 Prime XBT is a relatively new trading platform that lets traders take advantage of the ability to trade major cryptocurrencies with leverage. This makes it possible to trade crypto without having to invest a great deal of money. The exchange aims to overcome the common problems of other platforms, including long KYC approval processes, unexpected downtime, low liquidity, problems trading on markets that are failing, limited order types, poor user experience, and high trading fees. Instead, PrimeXBT offers amazing leverage, a highly user-friendly interface, an extensive amount of liquidity, and more. Leverage is one of the many features that advanced traders tend to look for, but most platforms offer very limited leverage when it comes to trading cryptocurrency. PrimeXBT stands out by offering leverage of 1:100. This means that for each $1, you get $100 worth of buying or selling power. This essentially gives you access to a greater market position, so you can make even more profits, or indeed losses. Leverage is one of the key features of PrimeXBT and among its main features. 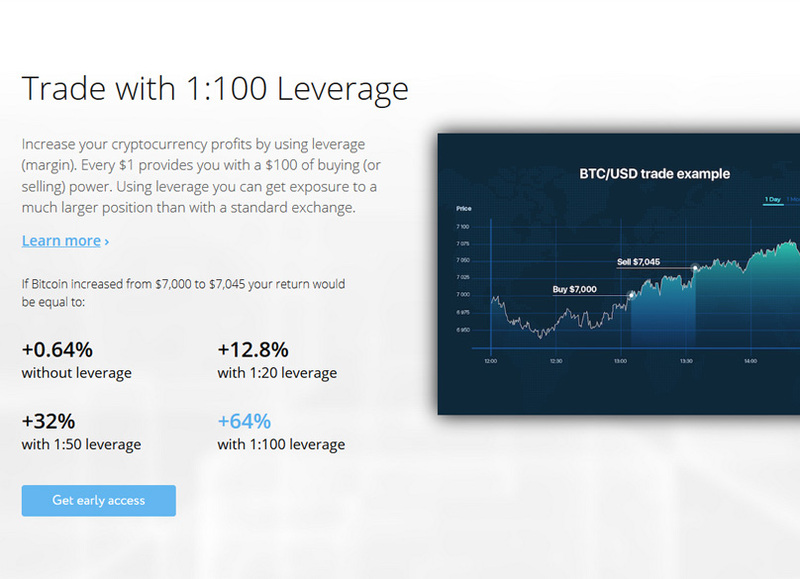 The website also offers a detailed explanation of leverage on its website to help those that do not fully understand. This explanation includes an example with BTC/USD for example. In this example, assume that Bitcoin is $10,000 each, and its price rose by 5 percent during your investment. If you were to use a traditional exchange without leverage, you could buy 10 BTC for $100,000 (10 x $10,000). If the price went up by 5 percent, your BTC would be worth $10,500 each so if you sell them, you will make $5,000 off of your $100,000 investment. In contrast, if you were to make the same trade on PrimeXBT with its 1:100 leverage, you would only have to pay 1 percent of the $100,000 position, meaning an investment of $1,000 up front. In the same situation, this means you would still make $5,000 but would have only invested $1,000. In other words, you can vastly multiply your profits with the same amount of initial capital. PrimeXBT explains some of the advantages of trading with leverage, including the ability to magnify profits, gearing opportunities (the ability to free up capital you can use for another investment), and the ability to gain when the market falls. There is also a convenient leverage calculator on PrimeXBT, so you can figure out your buying power based on your available capital. Just keep in mind that while using leverage increases the potential reach of your funds and your potential profits, it will also increase the potential losses. As such, you should always be cautious when using the maximum leverage offered on PrimeXBT. That being said, those with trading experience and confidence in their methods find leverage to be an incredibly useful tool. 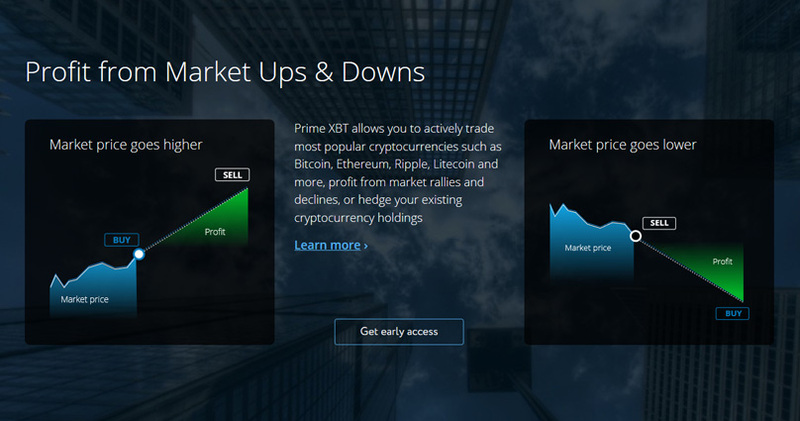 Since the cryptocurrency market does not always increase, PrimeXBT offers methods of profiting whether the market is going up or down. You can trade any of the most popular cryptocurrencies and hedge existing holdings or profit from rallies or declines in the market. In other words, you can go either long or short with PrimeXBT. Buying is when you go long while selling is when you go short. To go long, you would buy Bitcoin and watch your account increase in value while the price of BTC rises. In this case, a fall in BTC’s price would drop the value in your account. In contrast, you can go short, which means you open a position that will increase its value if the price of BTC goes down. You can view specific examples with calculations for each of these types of trades on PrimeXBT. There is also information on calculating your profits, so you can understand what is going on in your account. To calculate your profit or loss, you just take the difference in price points at opening vs. closing and multiply this value by the size of the position. If you combine it with leverage, you can increase your position size. In addition to the ability to go long or short and to enjoy leverage of up to 1:100, PrimeXBT stands out in multiple ways. It has a very user-friendly interface that fully customizable and includes support for multiple monitors. The trading platform is a best-in-class option as it is safe, reliable, and fast. 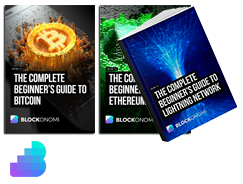 It is simple enough for beginners to understand yet includes the advanced tools that professional traders want. The charting tools are particularly useful with various chart types, a range of drawing tools and indicators, and the option of trading right from the chart. PrimeXBT also offers very low trading fees. You will notice straightforward and low commission rates, so there are no surprises. Additionally, PrimeXBT offers tight spreads. You can preview the live trading platform of PrimeXBT to get a feel for how it works before you open an account. The preview version of the platform is incredibly similar to the real version. 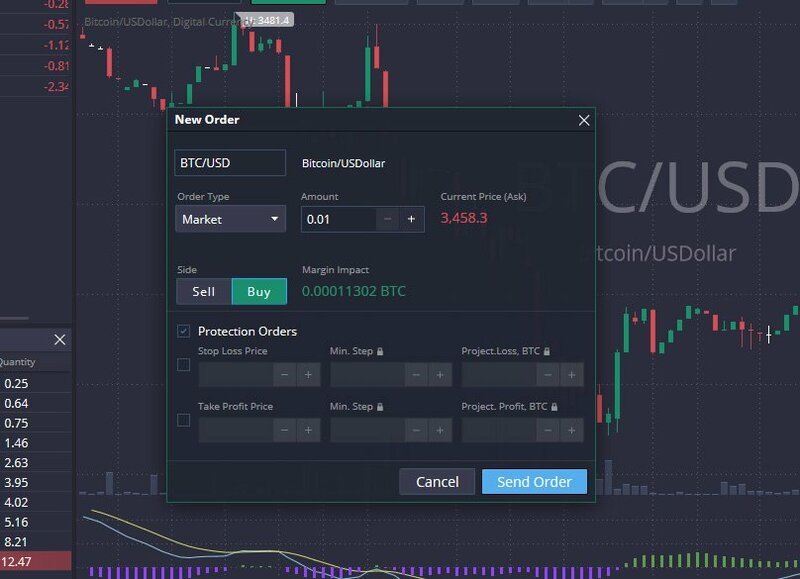 The only difference is in the very bottom section of the screen labeled “Positions.” If you have a live account, you would see a list of positions with the following columns for each: symbol, position ID, time and date, side, size, fill price, current price, take profit, stop loss, and P/L. Since the preview version is not associated with an account, this section is blurred out and over it, you will find the option to log in or register. Overall, the trading platform is exactly what you expect as it is very similar to the trading pages experienced investors are used to. On the top left side of the screen, you will see a list of cryptocurrency pairs. These include LTC/USD, BTC/USD, ETH/USD, EOS/USD, and XRP/USD. For each, you can view the bid price, ask price, and change. These figures are color-coded in white, green, or red. As expected, green indicates an increase while red indications a decrease. Clicking on any of the pairs listed here will bring you to a screen that lets you buy or sell the crypto in question. It will display the prices for buying and selling as well as the low and high for the pair. Below this section, still on the left of the screen, you will see the Order Book. The Order Book displays the information for whichever currency pair you most recently selected from the top left corner. It is divided into sales and purchases. A nice touch on this Order Book is that in addition to a list of the quantities and prices, it also displays a visual representation via graphs in green and red in the background. This way, you can see the current trends at a glance. 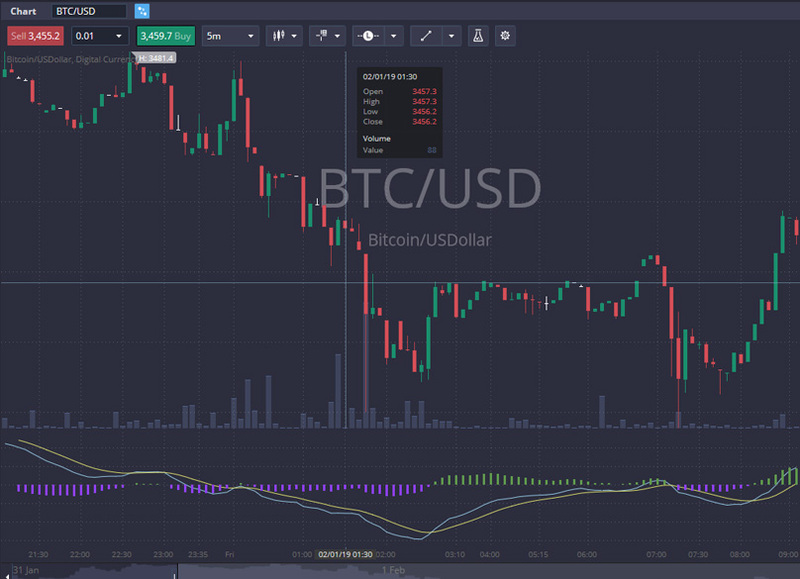 The main section of the trading page is the actual chart, which is directly to the right of the crypto listings and Order Book and takes up most of the page. The top left corner of the chart shows you the trading pair it represents. You can adjust this by clicking on the box where it is listed and typing in the new pair (you will notice autofill suggestions) or by clicking on the pair to the left in the crypto listing section. The default setting of the PrimeXBT trading chart is a candlestick chart. It is color-coded green and red with prices on the vertical axis and time on the horizontal axis. Hovering over any point on the chart will show you the specific date and time as well as the open, high, low, close, and value. You can increase or decrease the time range displayed by adjusting the time graph immediately below the main chart. The top of the chart is where you will find most settings. There is a drop-down menu that lets you change the intervals of the candlesticks. The default is 5 minutes, but you can also choose 1, 15, or 30 minutes; 1, 2, or 4 hours; or 1 day, week, or month. To the left of this is the option to switch from a candlestick chart to a line graph or bar graph. Next to this, you will find options regarding crosshairs. You can also choose long or short and from a range of 13 indicators, lines, and tools to add. These include things like a trend line, trend channel, and Fibonacci Rays, among others. Advanced traders will be interested in the Studies section, which is accessible via an icon of a test tube to the right of the above options and to the left of Studies. You can choose from one of several dozen available studies or add in your own study. Use up to five at once. There are two methods of trading with PrimeXBT. You can click on a pair on the left of the page and fill in the box that appears. Or you can use the section at the top left corner of the chart, directly below the name of the pair. PrimeXBT charges two types of fees, trading and overnight finance. Because instruments are leveraged products you finance the traded value through an overnight financing. This borrowing cost (financing) is dependent on the liquidity of the underlying asset. If you open and close a leveraged position within the same trading day, you are not subject to overnight financing. With PrimeXBT, traders are able to invest in cryptocurrency with an intuitive interface. 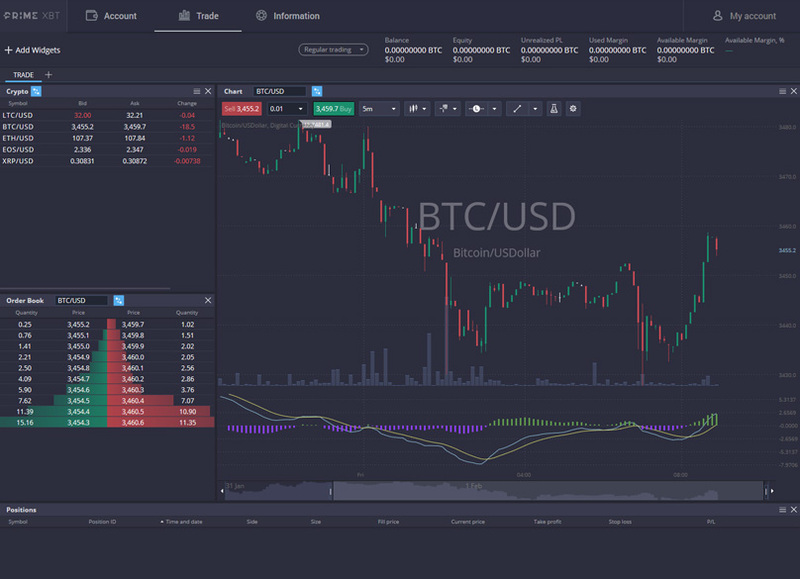 The trading platform is easy to use, and PrimeXBT stands out from the competition with its low commissions, tight spreads, and class-leading leverage of 1:100. The exchange just officially opened so you are now able to signup and start trading right away. The exchange is a new entrant so we would advise caution initially until they have proven themselves over a long period of time. Do not use the exchange as a wallet, you should store your coins in cold storage for the long term and just keep a trading stack on the exchange. As with all types of exchanges that offer leverage, we would advise you to proceed cautiously if you haven’t traded in this manner before. It’s quite easy to get things wrong and end up being liquidated and losing your cryptocurrency in this way, especially if you are employing a high amount of leverage.